Comments: Black-tailed prairie dogs, named for their black-tipped tails and dog-like "bark," once lived throughout the Great Plains in "towns" that extended for miles and contained hundreds of thousands of individuals. Current dog towns seldom exceed 100 acres due to changes in land use and poisoning. They excavate a complex underground system of tunnels and rooms that may be as deep as 15 feet with horizontal tunnels reaching 10-15 feet long. The soil is pushed to the surface to create numerous mounds. They forage throughout the day with sentinels sitting upright, standing guard as others feed. When a predator is sighted, the sentinel "barks" and the entire colony scampers to their protective burrows. Abandoned burrows provide homes for spiders, salamanders, toads, ornate box turtles, snakes and burrowing owls. In the spring, females produce a single litter of 2-10 pups. They may live up to 8 years. Distribution: Black-tailed prairie dogs live on the High Plains from northern Mexico to southern Canada. They are found in shortgrass prairies and overgrazed rangelands of the western half of Kansas. 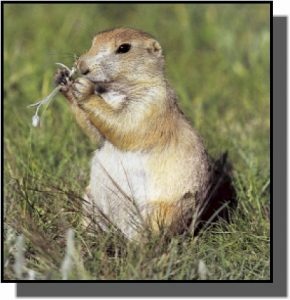 Food: Black-tailed prairie dogs feed primarily on green vegetation, including grasses, forbs, seeds, stems and the occasional insect.